John Gray sent this image in March 2011: my grandparents lived at 76 Distillery Rd during the years before WW II and after up to I believe part of the fifties. I do not know the exact date of the attached photo but I am the fourth from left in the front row and I was born in May 1931, so I assume it was just prior to the start of WW II, some of your users may be able to add more info. I lived with my grandparents at that time, their names were George and Kate Gray. 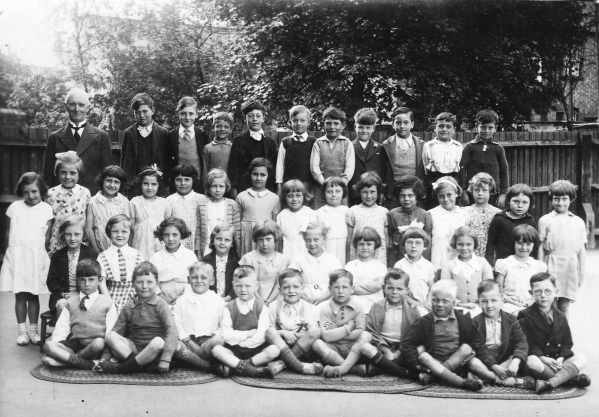 The photo shows 45 children (a big class by today's standards), 25 girls and 20 boys. The girls have short hair styles (some pudding basin style), several with hair ribbons. Many have short-sleeved dresses, so I think the photo was taken in the summer, perhaps at the end of term? There is not a school uniform, the girls are wearing print dresses or blouse and skirt, a few of the boys wear shirts with ties. Jane, Jean Burwood's (nee Pilgrim) granddaughter, wrote February 2014 adding: my Grandad Stan Burwood is in the bottom row, 3rd from left. Next to him are the Bates twins (they emigrated to Canada but lived in Harnage Rd until the 1950's, both sadly passed on about 5 years ago now but visited my grandparents the year before..) and the white haired boy, 3rd from right is Frankie Ovens (still around as far as we know) These were all my granddad's great friends along with the infamous Jackie Chapman. (I will write more about him at a later date - he was a very well known Brentford boy and my grandad was in his 'gang'! They all had matching tattoos, 3 dots on the forearm!! I think he died back in the late 60's but I would have to check dates for that. My nan is still in touch with his wife, Thelma. Jeanne Whitby has sent a photo from St George's from around the same year, the mats used for the front row of boys looks familiar! If you can add any more names please get in touch.